Positives: Very serious, very dark (one of the kids "dying" again), storyline progress! Addressed the issue I mentioned in my last review (that all this happens within an hour or two of their hometown). Negatives: The usual big plotholes, lack of logic, unrealistic adult characters. 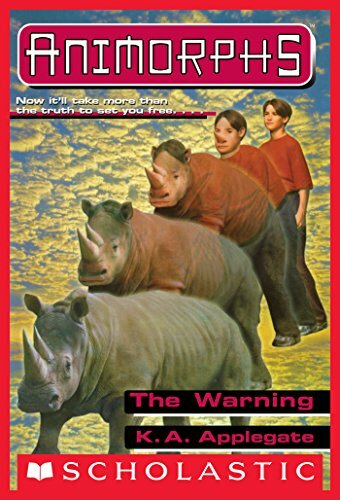 In this book chapter, the Animorphs discover that AOL WAA (Web Access America) might contain allies in their battle. Like the Area 51/Zone 91 thing from two books ago, there's not a single question that WAA is AOL, including it saying "You've got mail!" when you log in. It was interesting to have a semi-detailed reminder of what AOL was like in early days. Unlike every other book in the series so far, I had no idea how this one would end. And I loved that! More than that, this was probably one of the darkest books so far, too. One of the kids was killed, but if they unmorph from the animal shape fast enough they can avoid actually dying. But still, the kid experienced dying, his guts outside of his body, all that. And he had to do it all again a couple hours later. I know the ghost writing hasn't started yet, but this really felt like a completely different book than the last few. I wonder if the others (or this one), actually did have a ghost writer, but they weren't credited yet? There were some annoying plotholes, but all in all, I completely enjoyed this one. This book is what I'm reading this series for.